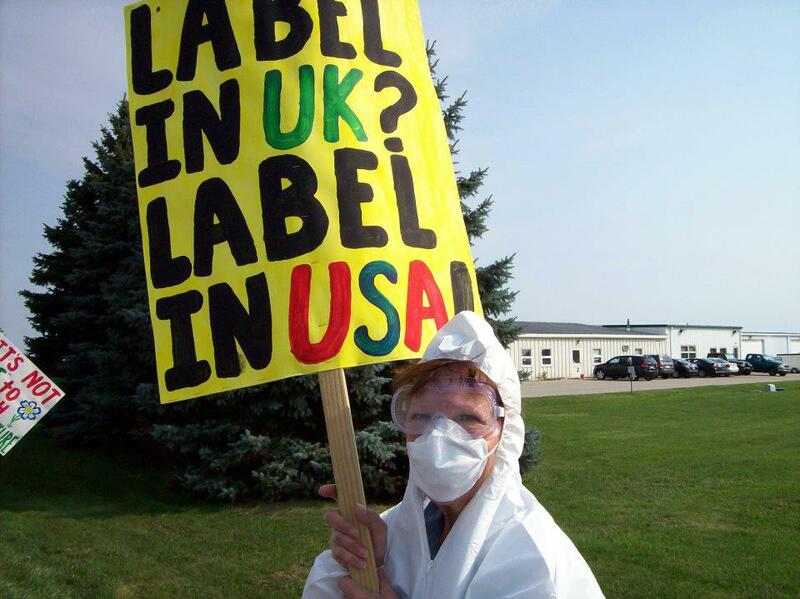 MASON — Melissa Chapman of St. Clair dressed in a biochemical hazard suit had a simple message. “We want to protect people,” Chapman said. 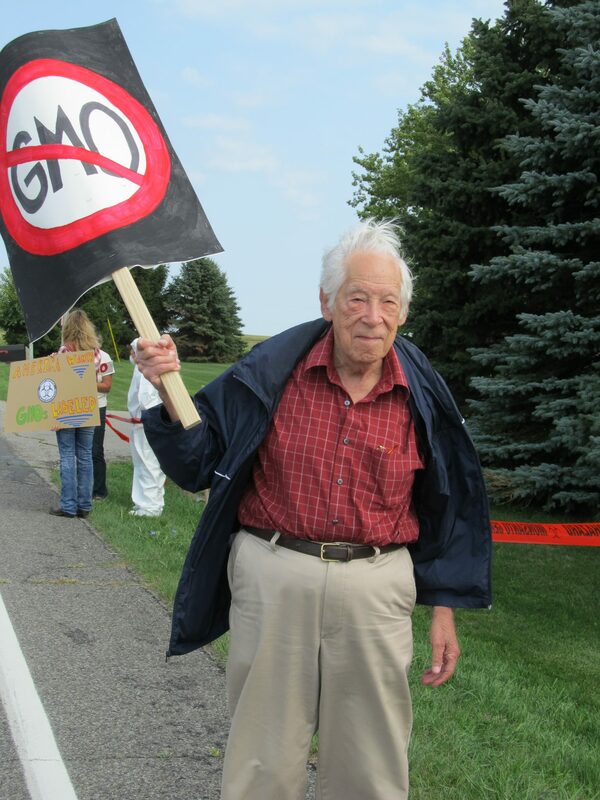 Chapman and 20 others protested in front of the Monsanto company as part of a nationwide movement called “Occupy Monsanto” Monday afternoon. 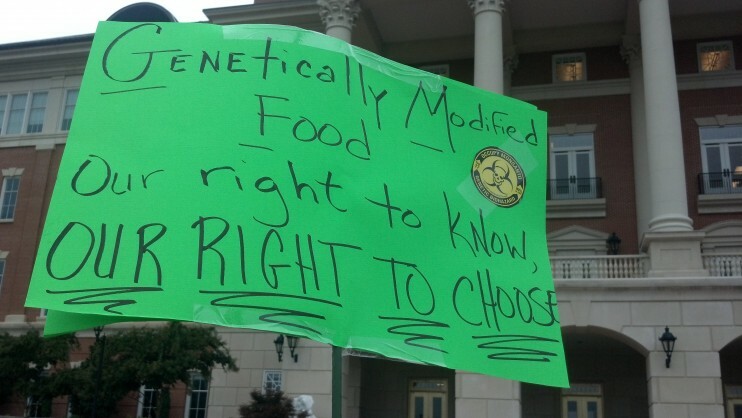 “We are basically here protesting the use of GMOs (genetically modified organisms),” Chapman said. According to Monsanto’s website, the worldwide company’s purpose is to work alongside farmers by selling seeds, developing traits through biotechnology and crop protection chemicals. In 1982, Monsanto’s scientists were the first to genetically modify a plant cell. 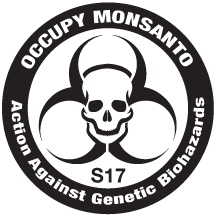 Chapman, who is involved with the Occupy Monsanto Genetics Crimes Unit, said she would like to see labels on products that use GMOs. “What we figure is that if it is labeled, people won’t buy it,” Chapman said. We arrived around 10 a.m. In the end, we were 13 in total. The cops came by a few times and just asked us to stay behind the white road line and not impede traffic. We got a number of positive thumbs up and enthusiastic beeps from people driving by, along with a few middle fingers! Even the employees leaving the facility for lunch gave us thumbs up! There was an older woman visiting from CA who was very passionate and who is heavily involved in the passing of Prop 37 there. She knew her stuff and was great to talk with. There was also a woman my age who was an organic farmer in Fowlersville. He dad is 82 years old and is a “monsanto farmer!” She is dubbed as the black sheep of the family. I learned a lot from her! When I first arrived, I sat in the grass on the easement across from their front door…to give them time to notice me. 😉 I promptly saw people peering out of windows, and a gentleman who appeared to be security stood on a 2nd floor balcony and looked at me (I smiled and waved, but he didn’t wave back). Then I gathered my things together as the rain began to fall and starting walking the perimeter of the building, sign on my shoulder. A gentleman walking with two older ladies passed by and asked what I was doing. I briefly explained my stance, and he said “sure, they should at least let us know what we’re eating! Stand strong, girl!” and they continued to walk. A couple of passersby asked what I was about, and some studiously avoided eye contact (lol). A very pleasant young lady who worked in an adjacent building approached me, because she couldn’t read my sign from her window. She and I had a very enjoyable and educational discussion. She is apparently a researcher of some variety, so we discussed the various sides of the debates in regards to things like the vitamin A enriched “super rice” and environmental manipulation. Ultimately, on some things we agreed, and others we differed, but we agreed that everyone would benefit if agribusiness, lobbyists and concerned citizens could figure out how to come to the table and agree to transparency and honest communication. About 50 protesters, on the one-year anniversary of the beginning of the “Occupy” movement, were in front of a Monsanto plant in Davis this morning, saying they want to shut down the local office of the multinational biotechnology company. In March, protesters staged a similar protest. 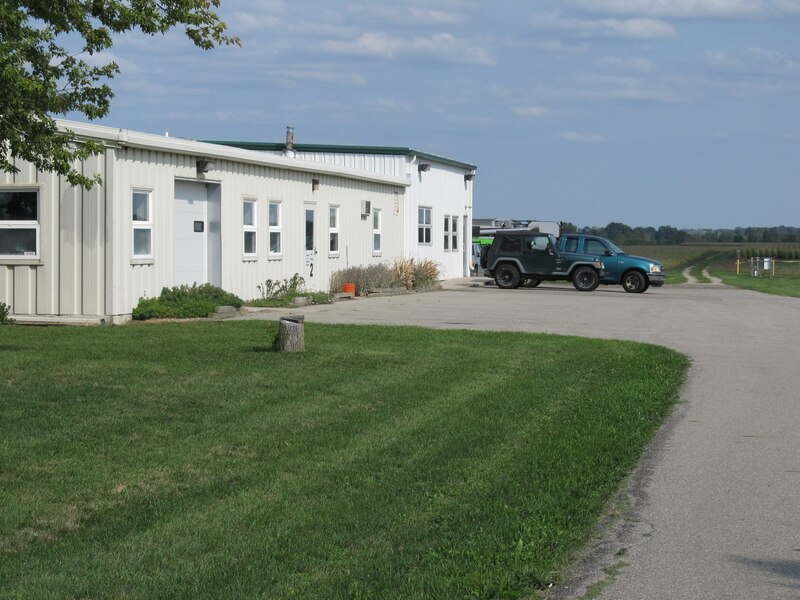 At that time, the Missouri-based company decided not to open its Davis office and did not make anyone available for comment. 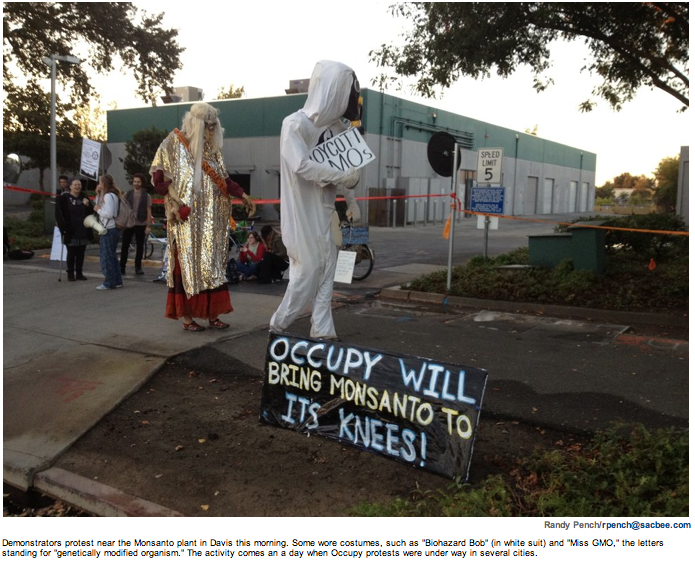 Davis police were monitoring the situation about 7 a.m. today as protesters sat, stood and paced outside Monsanto. 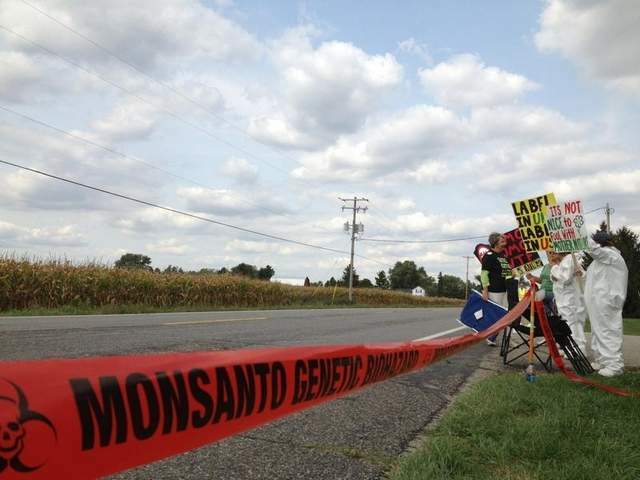 Demonstrators had one driveway to the Monsanto complex partially blocked with yellow caution tape. 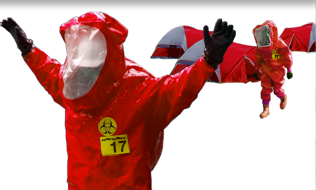 Protesters carried signs that said “Occupy will bring Monsanto to its knees” and “Genetic Contamination is forever.” Some of the protesters wore costumes resembling hazardous material protective gear. Protesters said the effort is in conjunction with other “shut down” Monsanto demonstrations worldwide.